Warranties offer you reassurance that the products you buy will keep working once you get them home — but if you read the fine print, many of these warranties have a lot of strings attached. It's common for warranties to limit your ability to repair a product yourself. Many manufacturers will void your warranty if products have been repaired by someone other than the manufacturer (or someone authorized by the manufacturer) or with anything other than manufacturer-provided parts. 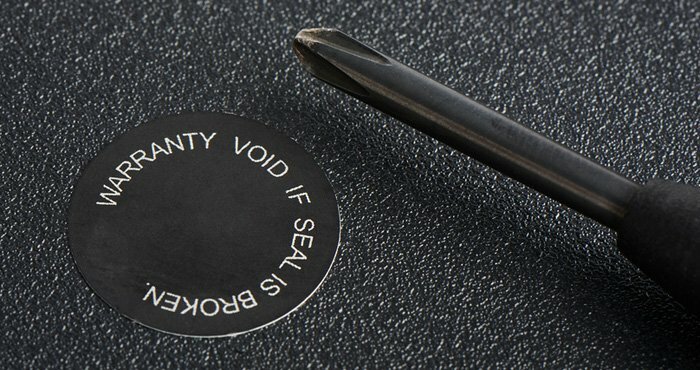 And if you want warranty coverage, the warranty seal — typically a sticker that prevents a product's case from being opened — must be intact. That means you can't make even the most minor repairs without going back to the manufacturer (and shelling out some cash). You may not think this matters. If your item is damaged because you'll contact the manufacturer for warranty repair. However, there are lots of things that aren't covered by a warranty, and this forces you to have those fixed by the manufacturer if you want to get warranty coverage later. Consider a broken smartphone screen. It's an issue that's common, but usually not covered under a warranty as it's due to damage rather than ordinary wear. Screens can be fairly economical to replace (either by going to a third party or doing it yourself), but doing so could void your warranty — at least according to companies' warranty information. That means any future problems you may have won't be covered, forcing you to pay for a more expensive manufacturer repair if you want to keep your warranty. But according to the FTC, restrictions like this aren't legal. Manufacturers can't force you to use their parts or service as a requirement for warranty coverage — and they can't refuse warranty coverage just because the warranty seal is broken. There are just two exceptions to this rule: the company can require you to use a particular part or service provider if it's free or the company proves to the FTC that a particular part or service provider is necessary for the product to function. However, neither of these situations are common. Still, this doesn't mean that the manufacturer has to provide warranty coverage no matter what. If your item was damaged because of work done by an unauthorized service provider or use of an unauthorized part, the company can deny coverage. That still leaves a lot of room for manufacturers to get out of providing warranty coverage for products, even though they can't require you to use specific providers. Now, the FTC has written to six companies requesting they review their warranty policies. We don't know which companies, but we can make some guesses: Apple has been pretty pushy about getting you to take your iPhone to the company for service, while both Microsoft and Sony cover their gaming consoles with security stickers. Each company has 30 days to update its warranty information to comply with the law, so hopefully, we'll soon see companies promising more generous warranty policies. In the meanwhile, be sure to read your warranty information carefully — and don't let companies push you around with illegal warranty requirements. If you run into this type of warranty problem, you can contact the FTC to file a formal complaint.